Good morning crafty friends, Suzanne of Cricut Crafting Grammy. I am so excited that Melin and the Design Team at My Paper Crafting are starting a new post for Thursdays, Totally Tags n' ATC's. Beginning today February 21, Thursdays will be the day to explore different themes, elements, techniques or embellishments. This week we are using ribbon on our tags and ATC's. There is no restriction on what tools are used to create these tags or ATC's. It could be a die cut machine, punches, stamps, etc. The sky is the limit. 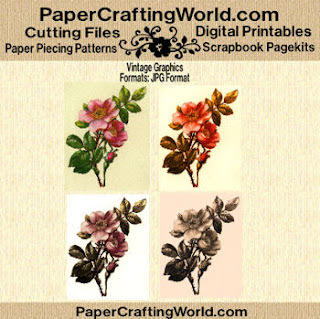 However if the Design Team uses Digis or SVG's they will be from Paper Crafting World. here is an interesting definition from Wikipedia. Walk In My Garden, Doodlecharms and George & Basic Shapes. Tutorial for dyed seam binding on my blog! Close To My Heart Stamps, inks and more! 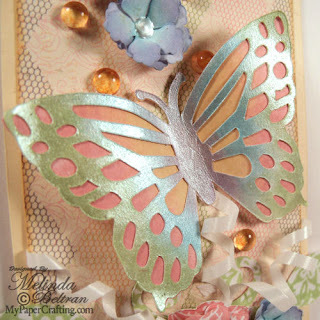 Butterfly and Flower how-to on my post. Here is a pretty vintage graphic for you to kick start your creativity! Please note: The price is listed as $1.00, when you add it to your cart and check out there will be no charge. Free during this week's Totally Tags N' ATC's Post.